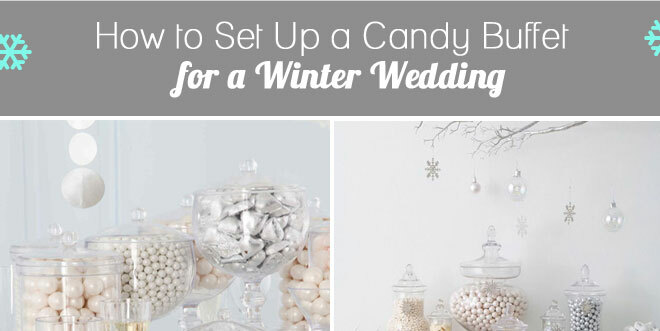 A candy buffet just seems tailor-made for a wedding in the winter season! 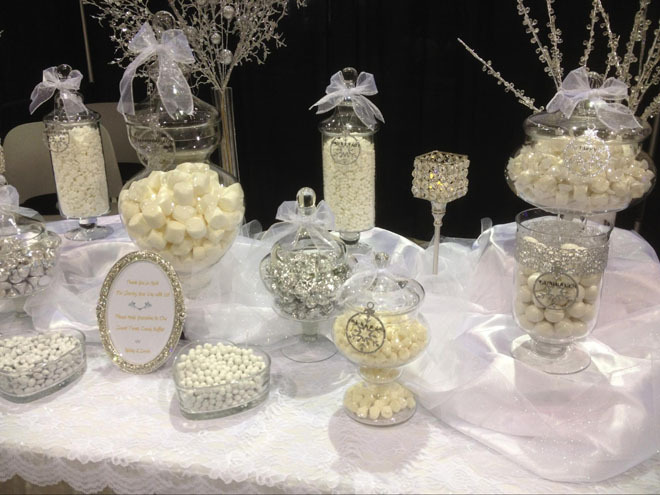 Especially if you envision one all in snowy white, with silvery and sparkly touches – from the array of candies and other sweets, to the glass and crystal jars, dishes, and bowls, to the magical backdrops. 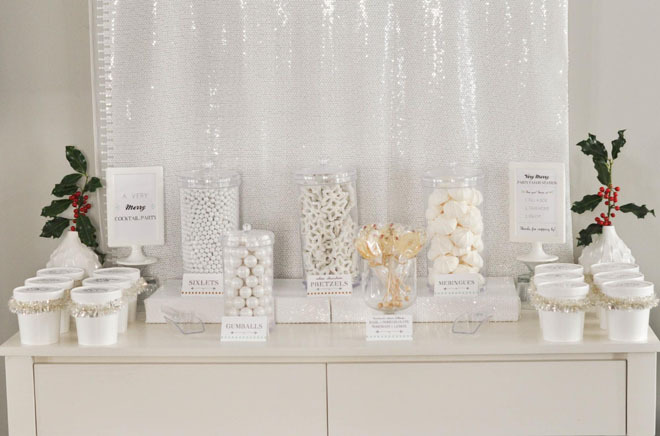 Here are some gorgeous examples of winter wedding candy buffets to inspire you as you plan your own sweets station for your wedding! *This post contains affiliate links. Ideas to inspire you: See the “snowy” backdrop made from white sequin fabric (totally reusable for other occasions), the handy white pint containers with printable labels on top, and the touches of tinsel and holly for that holiday cheer! 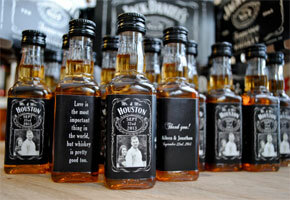 Visit the full post over at Live the Fancy Life to see these up close…and more. 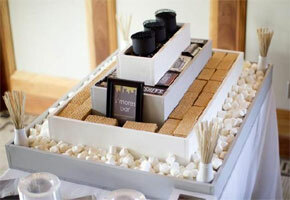 Ideas to inspire you: The 3-tiered console table provides such a charming base for this display that combines candies and baked goodies. 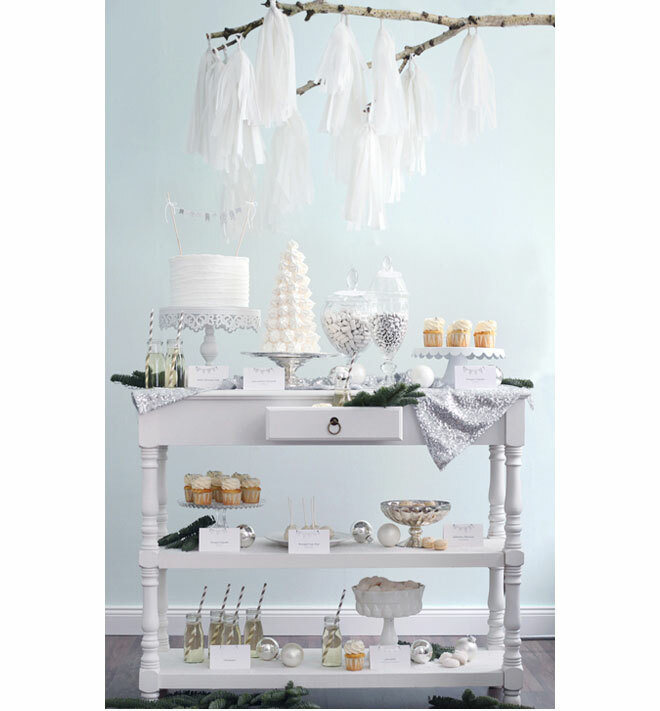 Notice the white-frosted cake with a mini bunting topper, iced cupcakes, and a “Christmas tree” tower of white meringues. Silver Christmas balls are tucked amongst the treats, while white fringe tassels hang overhead! Check out the full details at Zuckermonarchie. Ideas to inspire you: A vintage-style look is created by using shapely candy and apothecary jars and heart-shaped dishes. This look continues in the dainty lace table cover and white organza bows on the jar lids, the oval silver frame for the signage, and bunches of crystal branches in vases. We found this pretty display via Pinterest. 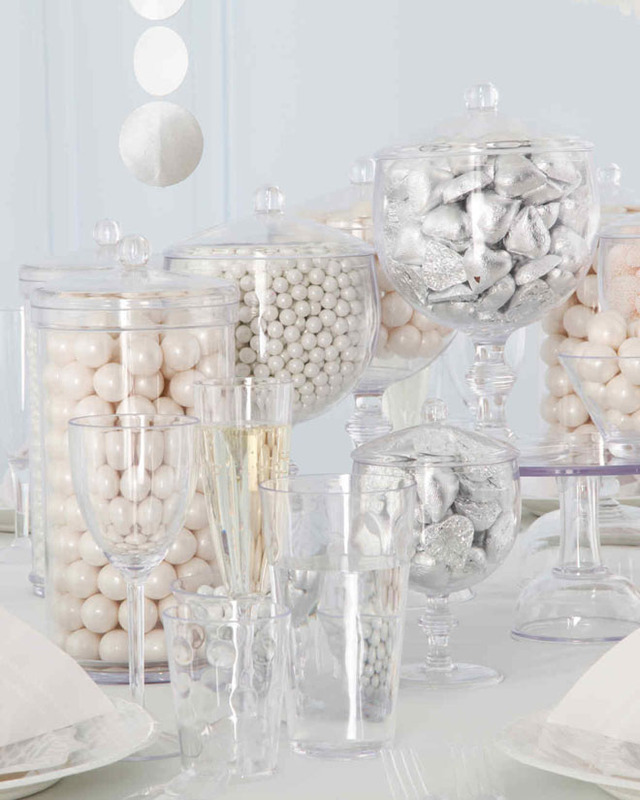 Ideas to inspire you: The combining of cylinder jars and stemmed jars creates varied heights for presenting the simple yet stylish selection of gumballs, sixlets, and Kisses. Hanging garlands of silvery discs and white star lanterns – not visible in the pic, but seen in the slideshow from Martha Stewart – complete the sophisticated effect. 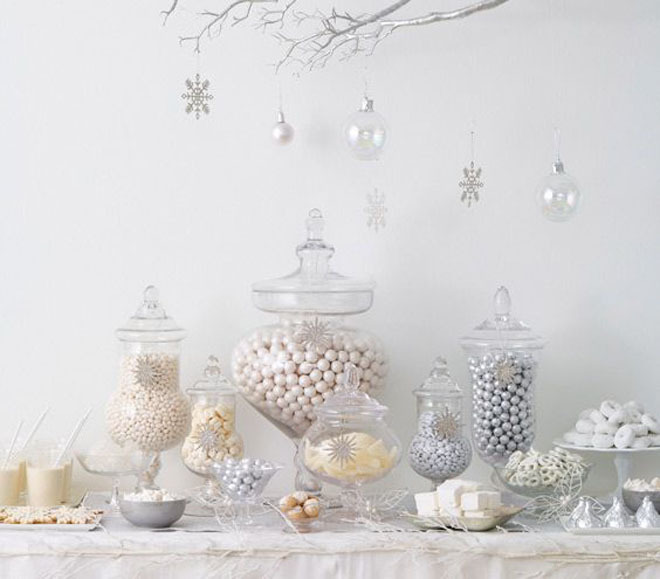 Ideas to inspire you: Love the “metallics” spin on this wintry sweets display featured on Real Simple, from the silvery candies to the soft grey bowls; the white-painted twig garland lining the table’s edge; the snowflake motif that adorns the varied shapes and sizes of glass jars, and in the hanging ornaments and baubles overhead. 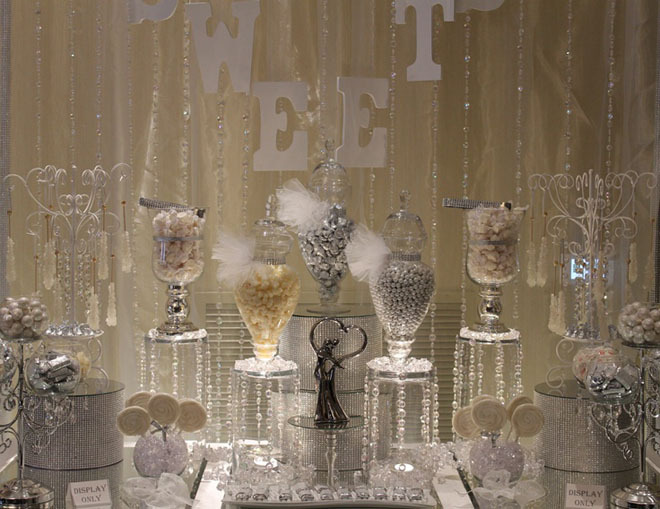 Ideas to inspire you: A Hollywood glam-look candy buffet, found via Sweetopia, uses lots of crystal and glass; fancy stands for the candy jars; fun display ideas like suspended rock candy sticks and whirly pops in globe bowls; and mood lighting to add drama to the display. 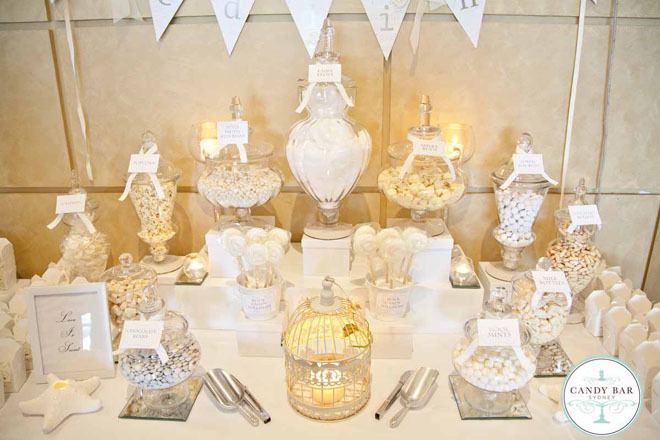 Ideas to inspire you: This elegant candy buffet via Candy Bar Sydney features vintage style detailing, such as a miniature bird cage to hold a candle; complemented by white starfish votive holders, white wedding bunting flags with brooch detailing, and simple takeout noodle boxes for filling with treats.